Review/discussion about: Fate/kaleid liner Prisma☆Illya 3rei!! I’ve only “acted” in a “play” one time, and it is one of the most embarrassing moments of my life. It was a small presentation within our English class. I took on the role of Jesus as he carried his cross to his inevitable death. But I had no beard. No robes. No sandals. Even the cross was just a meter stick. In short, I looked like any other nerdy, lanky teenager with glasses, a polo, and a pair of jeans. So, there I am, starting at the back of the class, pretending to fumble and trip and hurt as I make my way to the front. Everyone stared at this bumbling, dumb high-school kid who couldn’t even properly hold a marked piece of wood – and I wanted to run away from this whole ordeal. Fate/kaleid liner Prisma☆Illya 3rei!! features a host of villains who believe that they are in a play of sorts themselves. But, while nothing the anime does is to the same level of embarrassment as my “performance,” it seems that it, too, does not deserve an encore. 3rei (need to shorten it per usual) resumes right where 2wei Herz left off. 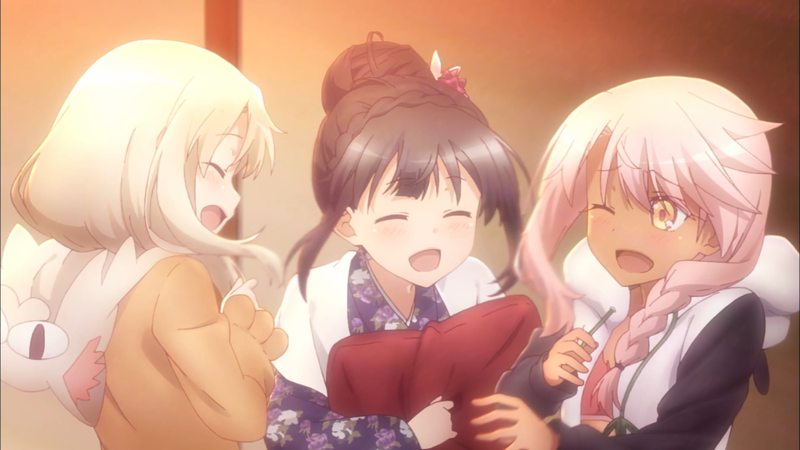 Illya, Miyu, and Kuro finish their summer-vacation homework – only to have Rin and Luvia summon them for yet another magical happening. However, everything goes immediately wrong when strange new foes kidnap Miyu, and Illya finds herself in a familiar yet unknown world. This season marks the fourth in the series. A feat that not many anime can claim to hold. Like its other seasons, this one focuses on a fresh plot, featuring both new and old characters alike – as well as one that seems uncannily similar. 3rei, though, in a welcome move, goes back to its first-season roots. 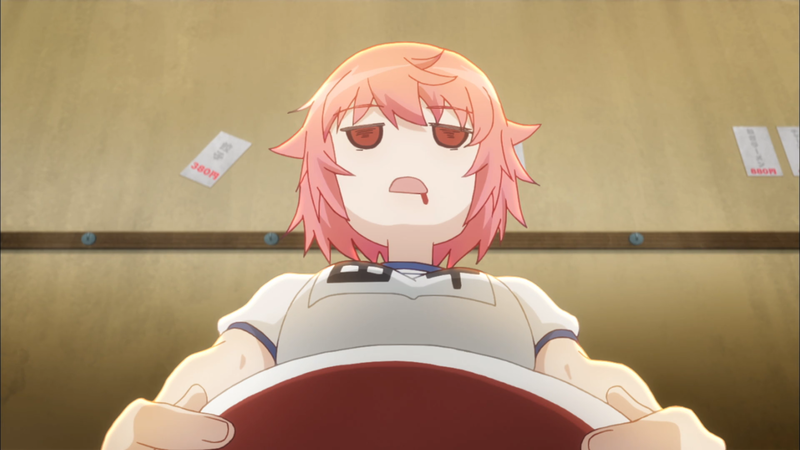 Where 2wei focused mostly on Kuro, and 2wei Herz was almost entirely slice-of-life shenanigans, this season focuses mostly on Illya while melding the slice-of-life antics with its drama and action. Episode seven and eight are a perfect example. 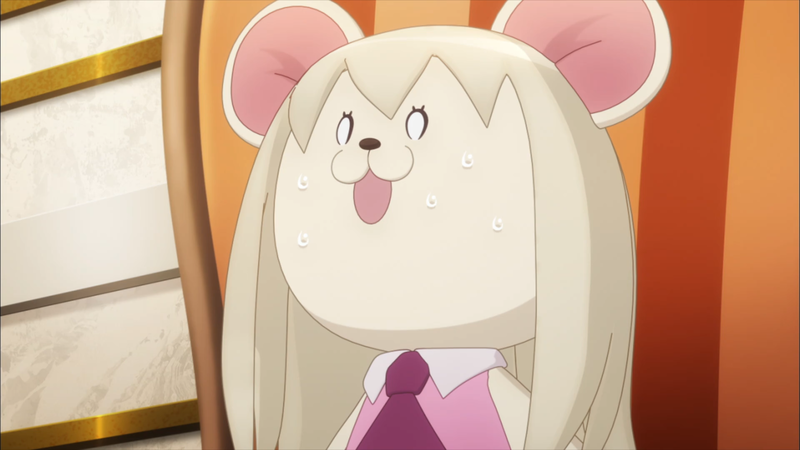 Illya’s stuffed-animal predicament is beyond ridiculous, but the combination of her weak magic against the possessed Rin and Luvia, which later turns into her fighting for her life alongside Kuro to save Miyu, is both hilarious and intense. The anime also takes its Fate franchise connection to heart more so than usual. Kirei appears, running a local ramen shop. Sakura’s yandere tendencies come to light. And Rin uses her rare, red life gem on Shirou to save his life. This series has always had these references, from the setting’s city to the characters themselves, but it seems apparent throughout 3rei that, like its plot, it wants to stick with, well, sticking with its roots. So, why all the roots? It deals with what much of the narrative centers on. The plot of the anime centers on saving Miyu who has gone back to her roots (against her will). Gil wants to get his item back to go back to his roots. The Ainsworth family wants to save the Earth to bring humanity back to its roots. 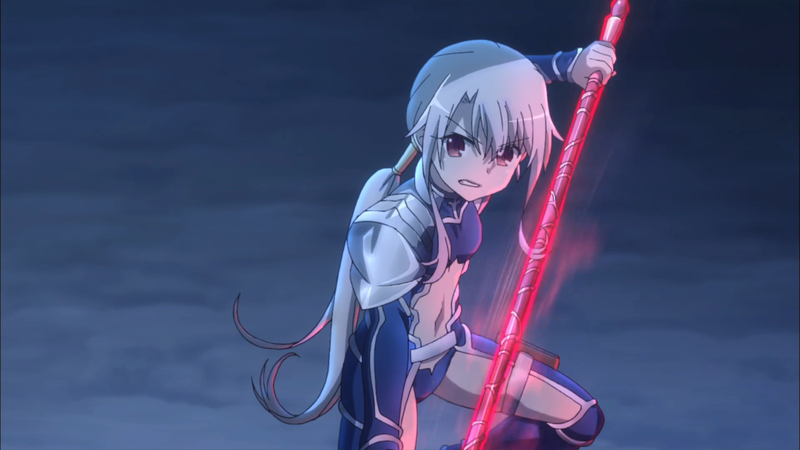 Illya fights to bring back her best friend, her life in general back to her roots. Miyu wants to help her Shirou (and vice versa) to bring their lives back to their roots. In a sense, 3rei is about bringing it all back to normal. While this theme is not explored, it has ties to the not-so-normal situations they find themselves in as well as the notion that life is simply better when it is familiar and whole (which the setting can Illya finds herself in can attest to). Thus, seeing this (small) throughput in many of the plot’s events bolsters the anime. What the plot contains, though, does not measure up well. One of the major issues is how many of the fights resolve. More specifically, how they don’t. Almost all of them involve an interruption of some kind: told to stop, phone call, don’t pursue when they can, Ainsworth father just walks away after Tanaka says something. It makes each encounter worthless since a meaningful outcome nearly never occurs. The anime also has some overly convenient plot points that push the narrative along in an eyebrow-raising manner. In episode three, Illya just-so-happens to find Ruby stashed away amongst the thousands of other weapons, and, immediately afterwards, she randomly gains the power to use the cards they have been chasing these past three seasons. Gil going away briefly when the Ainsworth family’s daughter and father arrive is not as convenient a moment, but it still comes off as unnatural. And Tanaka throwing her flaming sword arm (literally) is technically foreshadowed by the constant mentions of her warmth and ability to sustain massive amounts of damage. Yet getting the weapon, that ultimately saves everyone, out of nowhere and only because Tanaka woke up at the opportune time, makes for a less-than-fair development. Even the motivation behind the plot doesn’t work. Last season, it boiled down to “save Miyu.” This season, it also boils down to “save Miyu.” Yes, the dilemma this time is to a much higher degree than last time, but, when the plots at their core are almost the same back-to-back, it makes 3rei seem as though it does not know what else it wants to do (which is somewhat understandable being four seasons in). Its action sequences at least hold up well. Angelica using Gil’s Noble Phantasm against him. Illya personifying Lancer, Rider, and Saber as she dukes it out with Kuro. And the entire final battle (Shirou’s “Trace…on!”, Illya performing “Excalibur!”, Kuro coinciding with the Archer mindset). These are just a few examples that not only further highlight 3rei’s Fate roots but also present some really cool battles. And the “twist” – that Illya and the gang are the “bad guys” in that they want to save Miyu and therefore doom this world to death – gives 3rei some much-needed intrigue. Granted, the villains are still overly evil, like when the father (awkwardly) spanks Erica to punish his child or when Beatrice goes psycho during the fights. Meaning, it’s clear that Illya is still in the right and their enemy is still in the wrong. But it was a nice change to the plot. 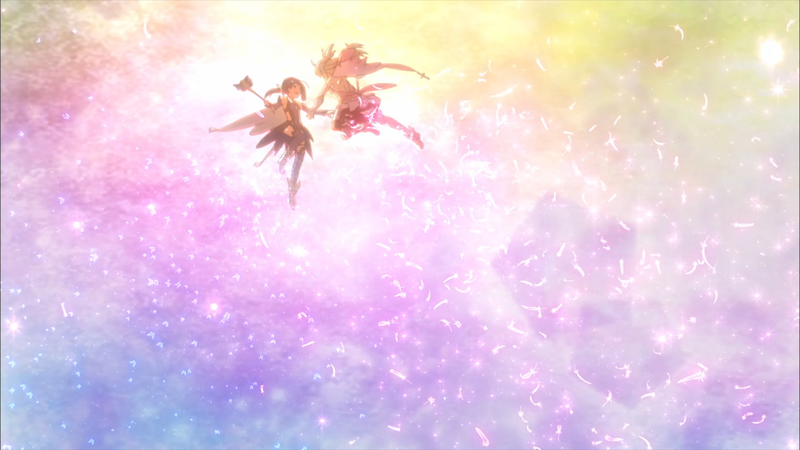 3rei somewhat punches itself, though, when Illya declares how she’ll save both Miyu and this world. But it’s at least a very magical-girl stance if there ever was one. Which, once again, demonstrates 3rei going back to its roots. Not much else can be said about the art and the animation that has not already been reiterated for these past few seasons. The dreary city is a bit dull, and both the snowbound school and the open crater do not contain much in terms of detail. But the summer-sitting castle and the different magical backgrounds do what they can to make up for the general lack of intrigue. The battles help with this, too, persisting in their flashiness thanks mostly to the Noble Phantasms wielded all over the place. Beatrice’s Mjolnir, with its intense lightning effects, is a prime example of how over the top the particle effects and extravagance can go. Character designs for the main cast (perhaps obviously) remain just as pretty per usual. Kuro’s dark skin and multi-colored eyes, Illya’s numerous transformations, and Miyu’s damsel-in-distress black dress continue to impress. Not to be outdone, the newcomers are likewise impressive. Angelica’s attractive design: white blouse, long skirt, long blonde hair, ample figure, golden armor with red tattoos and a bikini to boot (when fighting with Gil’s Noble Phantasm). Beatrice gnashes her spiky teeth and glares with her creepy yellow eyes while wearing a black, white, and red outfit with fiery twin-tails for hair. And Erica’s blue eyes, green jacket, and high socks give her a cute look that fits her character well. Also, deserving its own mention is Illya’s stuffed-animal design. Her lanky arms, big head, and small body made each scene with the bear that much more silly. As for the actual animation, it remains in a solid spot for most of its run. Downtime is filled with reactions from Illya or Tanaka bumbling around like a buffoon. Its singular yuri scene, where Illya and Kuro “transfer mana” with as much passion as possible, arguably receives the most attention when compared to everything else offered. But it also picks up during those fight scenes without any noticeable drops. Kuro soloing Angelica while Illya contemplates what route to take. The entire final battle that involves numerous heroes made of muck. The two-on-one duel on the giant sword. Throwing people with one’s fist to catch a falling brother. Flailing chains atop a rocky outcrop. A climactic and cinematic flying segment to end the whole battle. Lots of movement and fighting and action that proves the series has yet to let up on an animation front. This section is very tough to analyze because there’s just not a lot there. That’s due to what the anime places priority on – the action and the plot itself – and where the anime is at this point in the series – in its fourth season where not many new experiences or developments can be had for the cast. Illya is arguably the most important, and, despite Miyu’s predicament, is the focus of this season. This time around, the anime targets her trepidation. How she feels fearful of where she’s at and the way she approaches the world around her. Kuro’s there to push her in the right direction (through a fight to the death). She explains how Miyu never complained about her situation when she was thrust into an unfamiliar world, so it’s unfair for Illya to think any differently. And, when it comes time for her to decide to protect Miyu or this strange world, Illya chooses both because, as she says, it’s illogical to believe it must only be one way or the other. What Miyu receives on a character level is more fundamental: sides. She’s always cared for Illya and Kuro, but the audience sees her willingness to sacrifice herself as well as the extreme elation she has in hearing and seeing her two best friends fight for her. Furthermore, her having a brother who looked like Shirou from Illya’s world was always implied, but it was not until this season that such an allusion was no longer an illusion. She disregards her own safety to protect him, and she drops some of her coolness to replace it with cuteness when she talks with him in a more personable manner. Kuro herself sits on the sidelines for most of the season (and, indeed, for the first few episodes, only shows up briefly). It’s not until later that the anime gives her slightly more attention. She fights in Illya’s stead while she contemplates what to do, demonstrating Kuro’s usual steadfastness and willingness to push forward even if she may be in the wrong. But, more interestingly, when she pairs up with Miyu’s Shirou during the two-on-one duel with Angelica, she starts to express how she can pull off moves, feel what to do next, despite never really fighting in such a blazing manner before. It’s an obvious connection to Shirou’s own Archer background, and, while it technically does not get explored before the season finishes, it gives Kuro an opening in the future to possibly upgrade her own prowess. For Illya, Miyu, and Kuro, it’s all very minor happenings. 3rei arguably cares more about its plot: the funny skits and the kidnapping drama and the high amounts of action. Meaning, the main trio are there more to be themselves rather than go through sweeping arcs like in the first or second seasons. Thus, it falls on the new characters – specifically the Ainsworth family – to bring something new. For the most part, though, they do not hold up well. Angelica is arguably the best. She’s thought of as a doll. One who only listens to orders like fighting against their enemies or stitching up Erika’s stuffed animals when they rip. She control’s Gil’s Noble Phantasm as well as the space-shifting magic of the family. She does not understand Kuro’s illogical thought process of saving Miyu (just one person) and dooming the whole Earth in return (literally everybody else). But she only becomes interesting when she loses to Shirou and Kuro (mirroring the fight between the “real” and the “fakes.”) Upon doing so, Beatrice (and by extension the Ainsworth family) abandon her, leaving her with nowhere to go. Except with Illya and the others. For, while she sees herself as a doll, as a tool and nothing else, the others are willing to accept her. This foundation sets her up for eventual discussions and developments related to free will, but, given that this all appears at the end of the season, the audience will not see this for some time to come. The others – Julian, Beatrice, and Erica – have their characteristics that set them up as the villains and the victims. Julian gets into extreme fits of rage and holds an immense amount of power. Beatrice is a psychopath, obsessing over Julian beyond what anyone would consider healthy. And Erica’s insistence that she is a lady that never needs any help (but she really does), and the fact that Miyu turns down Erica when the little girl asks if they are friends (which is arguably the best writing moment of the season), gives her the cuteness and the sympathy needed to make her Holy-Grail transformation an unwelcome sight. Are they strong villains? Not particularly. Mostly because their connection and overall motivations in relation to Illya are not too intricate. They kidnapped Miyu, but that doesn’t make them worthwhile antagonists in the long run. At the minimum, the idea that they may in fact be the “good guys” given what they want to do (even if Julian’s ritual near the end does seem a little like an end-of-the-world scenario rather than a save-the-world one) adds a small twist to their characters. That leaves Tanaka – and ends her analysis, too. For, beyond her warmth, her carefree, jokey attitude, and strange ability to yank off her arm and have it turn into a flaming sword, not much else is known, let alone given, about her. She does have a deeply rooted hatred for the Ainsworth family that seems to flip a switch within her, turning her from bubbly to berserk. But this mystery is left as such – most likely for the next season to unravel. 3rei’s opening track starts off in a rather intriguing way with the rising tone and vocalist – before immediately dropping for a moment. Then, once the piece officially starts, the acoustic guitar, steady beat, and continued vocal work carry it along. The piece gets stronger in the second half when the violins kick in and the background choir has more of a stage presence (relevant phrase here), so, overall, it’s a solid song to lead with. The ending track gets groovier, mixing a slight techno feel with a pop-like composition. Some quick lyrical sections, futuristic drums, and harmonizing form an odd piece that may not fit 3rei itself but still manages to come off as catchy and interesting. However, per usual, the voice-acting performances are the strongest part of the sound department. 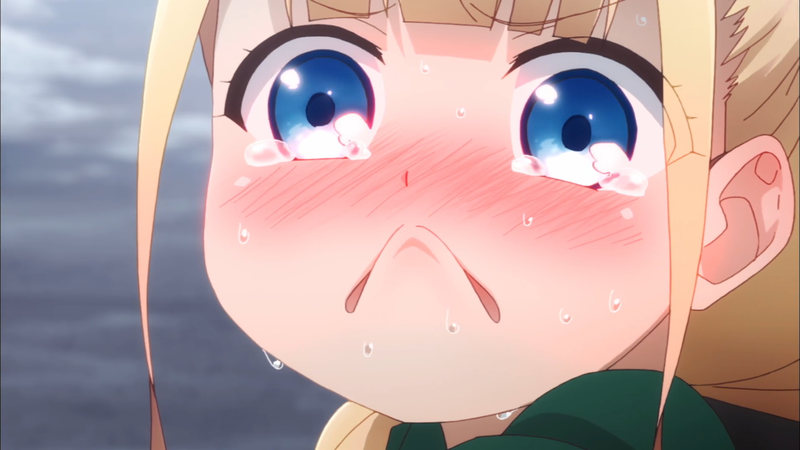 Everyone reprises their roles again, such as Mai Kadowaki as Illya with her frantic reactions and Noriaki Sugiyama as Shirou giving his ultimate speech. The newcomers are worthy of praise, too. Especially Mariya Ise as Tanaka for her teasing behavior and Sumire Morohoshi as Erica for her embarrassment and general cuteness. While the original soundtrack is what it is, the sound-effects are more noteworthy. The different blades, chains, magics, actions, and abilities come off as a lot more impactful thanks to the sound design supporting it all. I’ll be totally honest; I am only watching this series because I am already this far into it. I like the Fate universe, but more so the main characters from it rather than the spin-off ones here. Illya is funny, Kuro is cool, and Miyu is cute, but I am never actively impressed by them, and I do not bring them up within other discussions. This season once again had very little of Bazett and next to no mention of Leysritt – my two favorite characters from the series. Angelica, Tanaka, and Erica were a few of the new characters introduced. Angelica is attractive, Tanaka is fun, and Erica is cute (this trio somewhat like the main trio), but, again, they are characters I do no particularly care for. The fights have their spectacle, the small Fate references are neat, and the slice-of-life segments are funny when they want to be. I very much liked the stuffed-animal arc for how silly it all was. But the show overall did not do enough to get me invested in the cast or the plight at large. What is amazing to me is that, even after this season (and given how the promotional video was just released), the anime is not done. It has a whole movie left to give, and I wouldn’t be surprised if another season was in the works, too. Given how it ended – the Ainsworth family were not fully defeated, Tanaka is still an enigma, Shirou and Miyu were just about to explain their own story – it’s essentially required to have a continuation. And, despite me not liking the anime that much, I’ll be there. I have come this far already; there’s no sense in backing away now. Fate/kaleid liner Prisma☆Illya 3rei!! is more of the same. An action-filled plot, pretty art, weak characters, passable music, and not enough to invest in. At least it didn’t have to walk around with a meter stick.